I love quick, easy, flavorful meals! I have posted several meals I have adapted from Rachel Ray's cookbooks and still love her cooking style. This cookbook has a similar style but the instructions are more detailed and it requires less multi-tasking. With some of Rachel Ray's recipes it takes several tries making them before I can perfect the timing. Her recipes often have 4 things going at the same time. This often requires me to ask hubby to stir or chop for me mid meal preparation. Needless to say I have found the Pampered Chef meals in this book just as flavorful but a bit simpler to prepare. Happy cooking! 1) Preheat oven to 350 degrees. Add oil to oven safe pan. Heat oil over medium high heat for 1-3 minutes on stove top. As pan heats, trim fat from pork and cut into thin strips about 1 inch wide. 2) Coat pork with 1 tbsp of jerk rub and rub into meat; for additional flavor add additional jerk rub to pork. Add pork to pan on stove top. Cook 3-5 minutes or until browned. Transfer pan to oven and roast 12-15 minutes or until meat thermometer registers 155 degrees. 3) As pork roasts, start salad. Thinly slice green onions. Set aside for garnish. Peel bell pepper. Slice top and bottom off pepper. Remove and discard seeds. Slice into thin strips. Peel and slice mangoes. Add mangoes and peppers to a medium bowl. Juice lime into bowl. Add 1 tbsp jerk rub. Toss thoroughly. 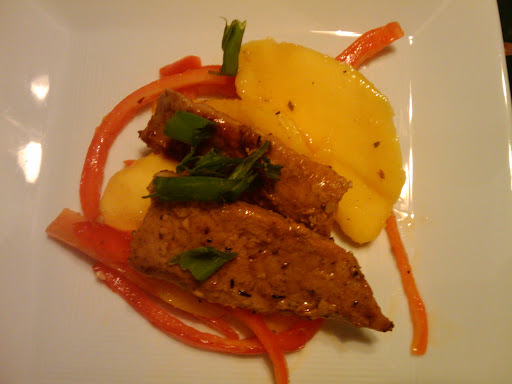 4) To serve, place portion of salad on plate, top with slices of pork, top with green onions for garnish. Sounds yummy. What did the Family think? We love anything with Mango!! I love mango, this would be a great recipe to try! I saw your name on a SITS list on Twitter of people who are attending the Bloggy Bootcamp in Baltimore! I just signed up as well! Looking forward to meeting at camp! Oh my gosh this looks awesome! Thanks for the yummy recipe! That sounds incredible! I would love to try this one.